'Tis the season to be jolly, and if you're an enthusiast things couldn't be sweeter! Pieces of the computer puzzle are finally starting to fall into place, and buying a new system is getting a whole lot less confusing than it was just a few months ago. For starters, there's finally a full range of PCI Express videocards on the market that are not generating a lot of consumer interest, which is forcing companies like nVidia to go back and release new products based on the AGP8X architecture! Although the recently released nVidia nForce 4 PCI Express Athlon64 chipset creates an excellent upgrade path for cutting-edge users, the demand in PCI Express videocards is.... 'complicated.' The still expensive, high powered PCI Express guns from ATI and nVidia have attracted a lot of demand from those who can afford it, but that leaves most users sticking to 8XAGP videocards for the time being. The same sort of situation hit AMD recently too. 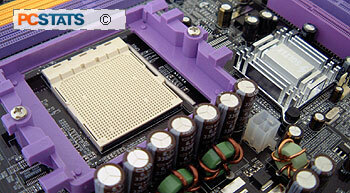 If you recall, initial sales of Socket 754 & 940 Athlon64 processors were lax because the dual channel DDR Socket 939 Athlon64 was just right around the corner. But now that AMD's socket 939 processor has been embraced by enthusiasts and gamers alike, there really is no other option in town. Sorry Intel, it just had to be said. With that in mind, it's good new that PCStats is reviewing an affordably priced AGP8X based motherboard produced by Soltek over the next few pages for you today. The new Soltek SL-K8TPro-939 motherboard is based on the VIA K8T800 Pro chipset, and with a sticker price of $135CDN is quite a steal next to the competition. 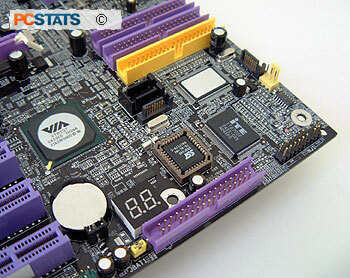 Like most Athlon64 motherboards these days, the SL-K8TPro-939 is very nicely equipped with IEEE 1394, 7.1-channel audio, Gigabit Ethernet, a Promise PDC20579 SATA/IDE RAID controller and the always useful Port 80 diagnostics card. 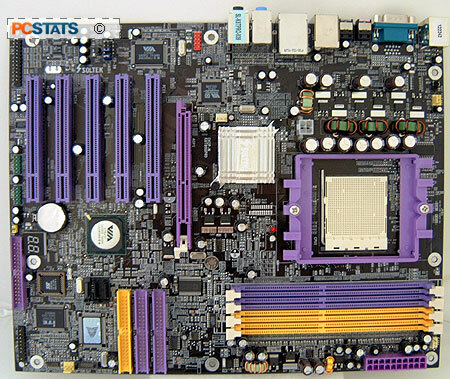 There are five 32bit PCI slots, four 184-pin DDR slots, as well as a standard 8XAGP port. There is a two way 1 GHz HyperTransport link between VIA K8T800 PRO chipset and processor which is 16 bits wide. That means there is a 8GB/s fat pipe between the processor and Northbridge at any given time, pretty impressive! Between the Northbridge and the VIA VT8237 Southbridge is VIA's Ultra V-Link connection that has a maximum bandwidth of 1066 MB/s. Not quite as fast or as much bandwidth as HyperTransport, but that's more than enough for today's PC. On a side note, Soltek's user manual incorrectly states that V-Link between the North and Southbridge chipsets runs at 533 MB/s while it actually runs at 1066 MB/s. I'm sure they'll have that little anomaly fixed in future revisions of the manual. The included software bundle is not particularly remarkable, comprising PC-Cillin, VirtualDrive, RestoreIT lite, Partition Magic 6 SE and Driveimage 4. What is nice is Soltek's decision to include a printed manual covering the operation of these utilities. We've rarely seen this before and we appreciated the attention to detail. Soltek did a great job with the user manual itself. It covers pretty much everything a new user might have problems with, from hardware installation to BIOS settings and even how to set up a RAID array. The Port 80 diagnostics card built onto the motherboard is a great feature, one which I wish more manufacturers would adopt as standard equipment. The card can help diagnose many computer problem including memory related issues, CPU problems and dead hard drives.